Designing an industrial-style kitchen from scratch or want to give your kitchen an industrial edge? Whether yours is a contemporary home or a period property, a stripped back, industrial style kitchen design will give you a lived-in, laid-back look that's hard to beat. Here's how to create yours. Find out more about designing a kitchen from scratch in our guide. Characterised by exposed brick walls, use of stainless steel and reclaimed wood surfaces, as well as their use of ventilation units and filament light bulbs as prominent design features, industrial style kitchens are easy to live with and maintain; in fact, they get better as they age. The dark blue of these kitchen units injects colour into an otherwise neutral industrial-style space, while the Shaker style is in keeping with the industrial style of the open plan kitchen design. This kitchen simple but elegant kitchen features a handful of industrial finishes, from the exposed pipework and chrome extractor fan, to the exposed brick wall and pendant lights. With just a couple of additions, another level of interest is injected into the space. On account of the simple floor to ceiling panelled glass, this glazed kitchen extension is flooded with natural light, while retaining its industrial feel. The built-in heated concrete bench, which allows the inside space to merge seamlessly with the outdoors, also demonstrates that opting for basic materials doesn’t mean losing out on high-end design. This open plan, kitchen, diner and living space extension is expertly zoned, using three different types of flooring, patterned tiles in the kitchen, charcoal tiles in the dining area, and rustic wood in the living area. This gives each space a distinct feel, all adding to the industrial feel of the space. 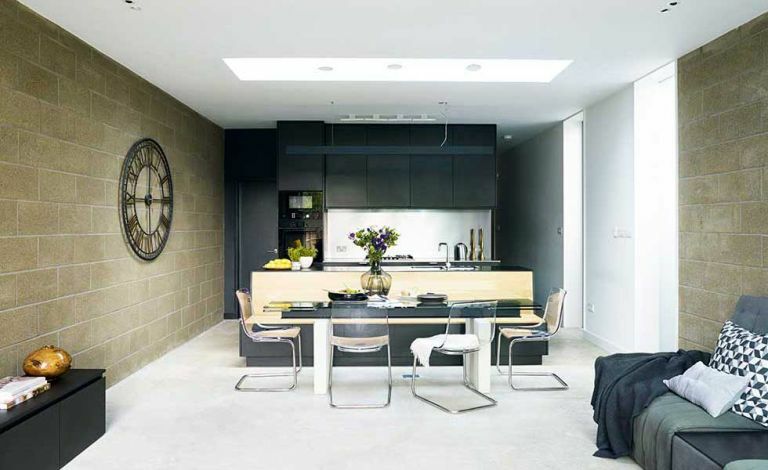 Find out how to create your own open plan kitchen, diner and living space. Pippa’s industrial style kitchen was inspired by her desire to respect the essence of her Victorian house in Cardiff, allowing it to reveal its character by stripping it back to its bare bones. The bespoke kitchen island, a key feature within the space, was made from reclaimed materials sourced from a salvage yard. These unique, caged light fixtures, complete with exposed cords, complement other industrial style features, such as a painted steel pillar and riveted dining table. This, in turn, enhances the factory feel that underpins this kitchen extension. Intending this kitchen to be the hub of the home, the Maordeen family chose a light colour scheme, comfy sofas and family photos, combined with specifically selected pieces of furniture that would hint at more of an industrial style. The locker unit achieves this particularly successfully and also doubles as an invaluable kitchen storage space. With its visible extraction unit, steel finish surfaces and exposed brickwork, this kitchen would not look out of place in a New York loft space. Owner James was keen to create a commercial look in his kitchen, and sourced reclaimed Moffatt Multiplex Modular units from secondhand catering suppliers, which he altered to fit the space. A new stainless-steel worktop and sink, made by Moffatt, pull the look together. See more of this kitchen extension. Mismatching bar stools instantly add an industrial feel, whilst increasing the sociability of the space. This was particularly important for Jo and Gary, who designed the space with the changing needs of their family in mind. Pendant lights make a design statement without drawing attention away from the garden views available on account of sliding glass doors. Clarrise and Karim’s modern extension demonstrates how concrete flooring and breeze block finishes don’t have to mean compromising on light and airy spaces. Despite being a last minute design decision, these features help to achieve the minimalist, industrial style that inspired this extension. Find out how to use exposed brickwork to create a feature wall in your kitchen. If you don’t want to commit to exposed brickwork, white brick-shaped tiles are a fantastic alternative. Keep kitchen utensils on display and fill Kilner jars with different varieties of pasta to add a taste of industrial style (we've got tons more storage jar display ideas, too). If you are coveting an industrial look, then bespoke is still the best way to achieve the kitchen of your dreams. Mind, industrial needn't mean heavy-look or brutalist – with the right level of craftsmanship, an industrial kitchen can still look elegant. Scavolini’s newest kitchen has been designed in partnership with Diesel, and the designer credentials show. The fittings are made from modular steel tubes that can be customised and recomposed according to your needs. The industrial-style metal frame table is also part of the Open Workshop collection, and can be finished in a variety of materials, from quartz to granite. Diesel Open Workshop kitchens start from £15,000. For more luxury kitchens, browse our 27 luxury kitchen design ideas we'd copy if money were no object.